The long weekend is nearing upon us and despite the recent changes of weather, we at the QEII Centre are very much hopeful that there will be plenty of sunny spells this coming week. So to make the most of the closing summer, we have compiled a three course meal that will wet your appetite. Our selections are summer themed recipes and these dishes have been created by our very own in house catering QEII Taste. Below we have each recipe listed with all of the ingredients required and step by step instructions. Micro plane and zest the fruits. Heat one pan on the stove till hot. Pour in Pimms and light to burn off alcohol, remove from heat and cool. Mix half of the Pimms with sugar, salt, the zest of the oranges and the lemon, add the fennel seeds, half the mint half the Chervil and mix together to form a paste. Spread the paste over the salmon on both sides. Wrap the salmon in cling film and put in fridge to leave for 2 days. Place the remaining ingredients (with the exception of the herbs) into one container and keep in the fridge. After 2 days remove from fridge and rinse off the marinade. 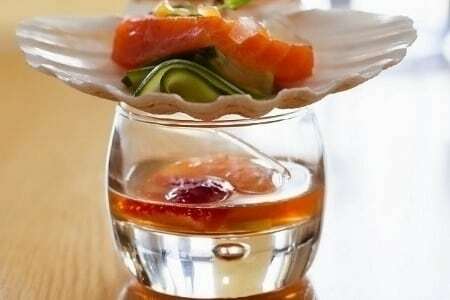 Bring back the remaining Pimms solution to the boil to reduce by 50% then sear the salmon steaks on a medium high heat in a pan brushing them with the Pimms reduction. Turn over and roast in pan. Freeze the remaining cucumber for 1 hour, mix with the mint and chervil. When removed from the freezer, serve with salmon. Cut all vegetables to about 2cm rough diced. Place in a deep tray and put the pork on top. Cover with water, cider, coriander seeds, garlic, salt and pepper. Cover in parchment paper and tin foil and braise in oven at 70 degrees for 6 hours. Remove from oven and allow to cool in stock over night. Reduce the poaching liquor with 100g brown sugar use to baste pork slowly roast on the bbq. Peel pears, place all ingredients in a pan and simmer for 30 minutes. Allow to cool then cut into halves, removing the seeds. Roast with the pork or separately on a BBQ. Add egg slowly, fold in almonds and flour. Roll sweet pastry 3mm thick and line frame. Pour mixture into frame and spread evenly. Slice pears and arrange neatly on top. Bake at 160 degrees for 40 minutes. At the end of the 40 minutes, pierce with a skewer, if skewer is clean then the cake is ready.